So I couldn't help it -- I had to paint my nails a second time this week! I just really wasn't feeling the Chanel Gold Lame from earlier this week, and decided to go bolder and darker for the rest of the week and heading into the weekend. My polish of choice? 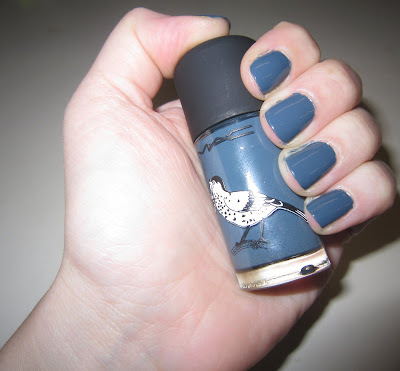 M.A.C Blue India from Spring 2010's Give Me Liberty of London Collection. This polish had been sitting in my stash for awhile, just begging to be used -- and finally, finally, I took it out! And you know what? I absolutely LOVE it. The opaque greyish blue glided on so smoothly and creamily, and the color is absolutely gorgeous. It's at once goth and demure. Not to mention the bottle is ADORABLE. Unfortunately, the Give Me Liberty of London collection sold out months ago -- but it is available on eBay! Disclosure: This product was furnished by a PR representative for M.A.C.